Have you ever taken a video with your iPhone (vertically no doubt, as it seems the whole globe collectively forgets to turn the thing horizontally for a better ratio) and been subsequently disappointed with the result? Maybe it hasn’t captured exactly the right tone. Maybe the necessarily grainy quality of the phone has rendered a glorious sunset a little…well, a little less than glorious. Maybe the excitement promised by the downing of that tenth tequila hasn’t been fully delivered on. Well, there’s a new app that seeks to inject the emotion back into your videos. It’s called ALIVE and it’s out now for iOS. Functioning like an Instagram for videos, ALIVE brings excitement and class to the moving image. Yes, I am aware that the mighty Instagram has a video option, but let’s face it; it’s slow, limited, tacked on, and compounds the collective errors by being as buggy as hell. ALIVE avoids this by a simple, clever premise. It receives its lightning fast rendering times from the power of The Cloud, so there’s no hanging around waiting on frozen frames and the like. A real relief, especially as doing anything related to video on iOS generally seems to cause problems. You can share your videos on a timeline once you’ve customised them, and view your friends’ creations in a similar interface to everyone’s favourite image editor. ALIVE provides you with all manner of tools to enhance your videos with. And we’re not just talking simple filters like ye olde Instagram. You can add music and animations too, even track movement in the video and attach an animation to it. 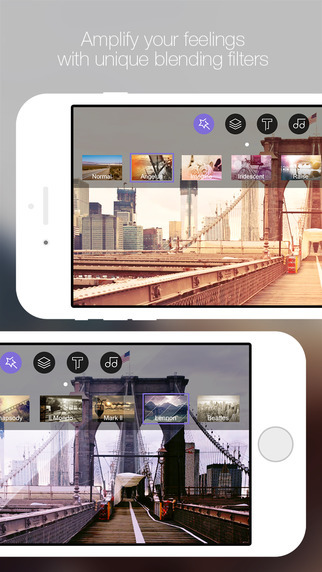 The app lets you shoot new footage internally, or you can choose old videos and make those better. It sounds complicated, but the smooth and stylish interface makes it a breeze to edit your videos. The music can be set to override your video’s sound, or it can be integrated as part of the soundtrack. You can add text too, and change the font and size etc. The editing tools are as comprehensive as they come. If any of this sounds tacky, rest assured it’s not. ALIVE is a classy operation. The effects and filters genuinely bring a sense of style to the plain, usually faded and desaturated videos that the iPhone routinely produces. The ability to motion track certain objects really is cool; it reminded me of that (now dated) app that lets you integrate helicopter crashes and missile explosions into video footage, but done far better. Personalising your videos to this extent is great, and if you get creative, hilarity will no doubt ensue. If you like the sound of adding a bit of sheen and character to your videos, you should ditch the ‘Gram and check out ALIVE. Head on over to the iPhone store to get ehancing and personalising your videos today for free!